The way power is generated is in transition: Whereas, before, all our power came from big power plants, these days it comes from a range of distributed sources as well, including wind turbines, photovoltaic systems and other similar facilities. This shift has a big impact on our grid – with particular challenges for operators of transmission grids. How to monitor the proper functioning of grid parameters such as phase angle and frequencies? Might there be discrepancies or anomalies in the proper functioning of the grid? Or are there lines or power plants down? Today's standard measurement technology is no longer able to reliably furnish answers to these sorts of questions. More and more operators are, therefore, turning to additional phasor measurement units (PMUs) and other digital solutions. These systems measure the amplitude and phase of current and voltage up to 50 times a second. This process generates huge volumes of data, easily several gigabytes a day. In response, researchers at the Advanced System Technology (AST) branch of the Fraunhofer Institute for Optronics, System Technologies and Image Exploitation IOSB in Ilmenau are looking for ways to optimize the data processing using artificial intelligence, with a view to improving grid reliability and establishing a power supply system fit for the future. 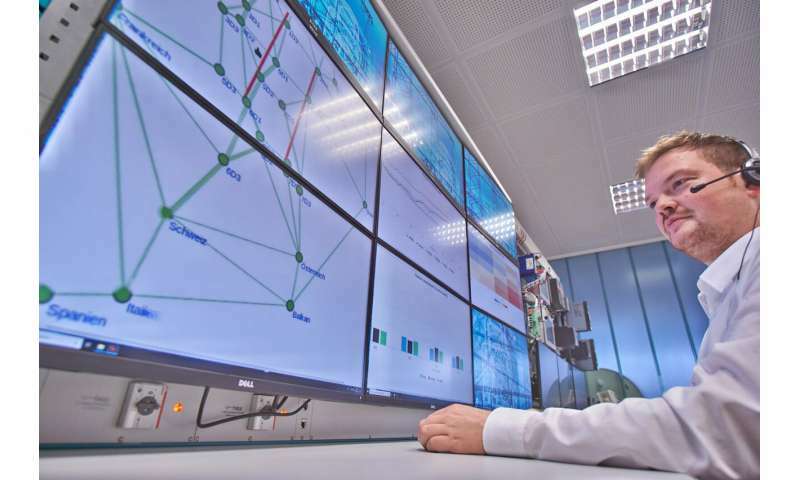 "We can use AI to automatically log, compress and process up to 4.3 million data sets per day," says Prof. Peter Bretschneider, head of the Energy department at the AST branch of the Fraunhofer IOSB. In the first phase of their work, the researchers have come up with a compression technique that saves 80 percent of the data. Not only is it easier to store the data, but faster and more efficient to process it too. In the second phase, the researchers went on to utilize the phasor measurement data they had collected to apply neural networks – one of the key components for today's artificial intelligence. More specifically, they "fed" the neural networks with examples of typical system outages. This way, the algorithms gradually learn to distinguish – and precisely categorize – normal operating data from defined system malfunctions. Following the training phase, the researchers applied the neural networks to current data generated from phasor measurements – data that previously had to be taken and manually processed. This is where the algorithm made its first leap into real-time application, making split-second decisions on where there is an anomaly or fault, as well as the type and location of that disturbance. To take an example, if one power plant should fail, an abrupt spike can be expected in the load placed on the other power plants. The increased load slows down the generators, and the frequency decreases. This calls for rapid countermeasures because if the frequency sinks below a threshold value, the operator may be forced to cut off sections of the grid for the sake of system stability. And by rapid, we are talking about less than 500 milliseconds. Since the algorithm is capable of reaching a decision within 20–50 milliseconds, that leaves sufficient time to implement the appropriate fully automated countermeasures. The algorithm is ready to be implemented, as the researchers continue to work on the control and regulation of the relevant countermeasures. The development is of interest not only to the big operators of power transmission grids, but also to regional distribution grids. "To make an analogy with the road network, what's the point of having clear motorways when the smaller regional roads are permanently blocked?" says Bretschneider. All the same, the researchers are not restricting themselves to the problems of today, but also want to factor in anomalies that have not even occurred so far. "If we continue to pursue renewables, it may lead to situations we don't even know about yet," says Bretschneider. Here, too, the researchers have turned to artificial intelligence, where they work on categorizing these sorts of unknown phenomena and developing the appropriate algorithms using digital network maps.